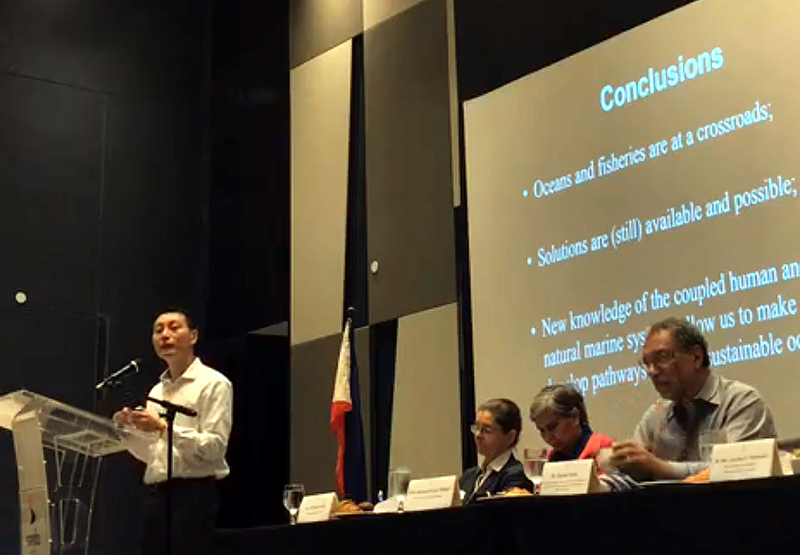 Q-quatics experts call for support on the restoration of Philippine fisheries – Quantitative Aquatics, Inc. Under the auspices of Oceana Philippines and Sea Around Us, fisheries experts led by one of the world’s top fisheries scientists Dr. Daniel Pauly (Principal Investigator of Sea Around Us at UBC and FishBase co-founder) were gathered together in Manila on 12 January 2018 to impart their knowledge on law and science as key to sustainable management and restoration of fisheries in the Philippines. 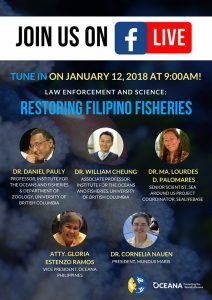 “We cannot let fishery resources continue to be overfished; this endangers our food security, both in the short term and in the long term, because overfishing also demolishes the ecosystems within which these resources are embedded,” says Pauly, a member of Oceana‘s Board of Directors. Dr. Pauly is also the principal investigator of a project emphasizing the reconstruction of the world’s total fish catch (see also Ocean Mystery: The Missing Catch), which is geared towards enabling fisheries managers with the data and tools to sustainably manage their resource sustainably for the future. 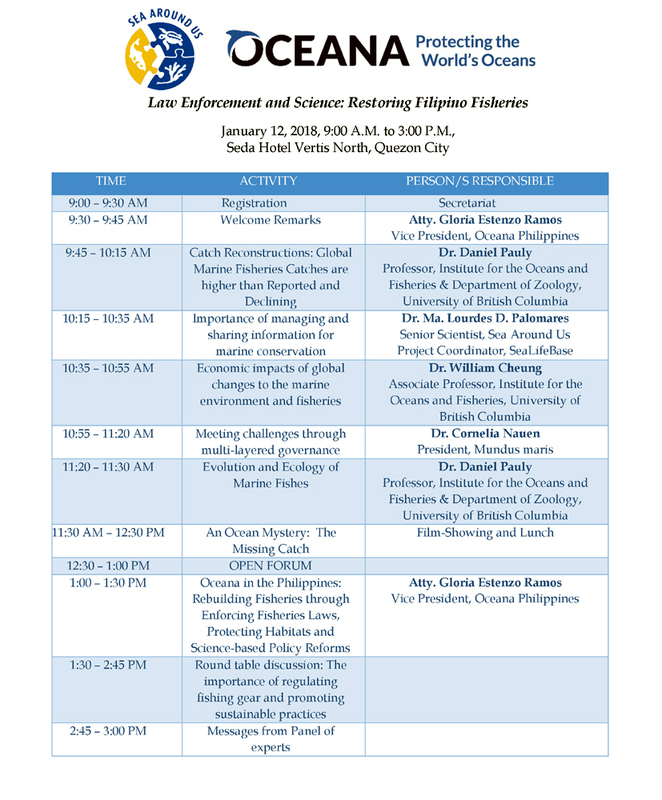 Most of the presentors at the “Law Enforcement and Science: Restoring Filipino Fisheries” conference are members of the Q-quatics Board of Trustees namely, Dr. William Cheung (Nereus Progam), Dr. Ma. Lourdes Palomares (Sea Around Us), and Dr. Cornelia Nauen (Mundus maris). Atty. 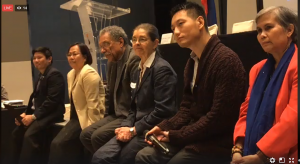 Gloria Estenzo Ramos, Vice President of Oceana Philippines, joined the panel discussion on how best to manage fisheries resources and conserve the country’s vast but threatened marine ecosystems with key stakeholders from the government, academia, and civil society. 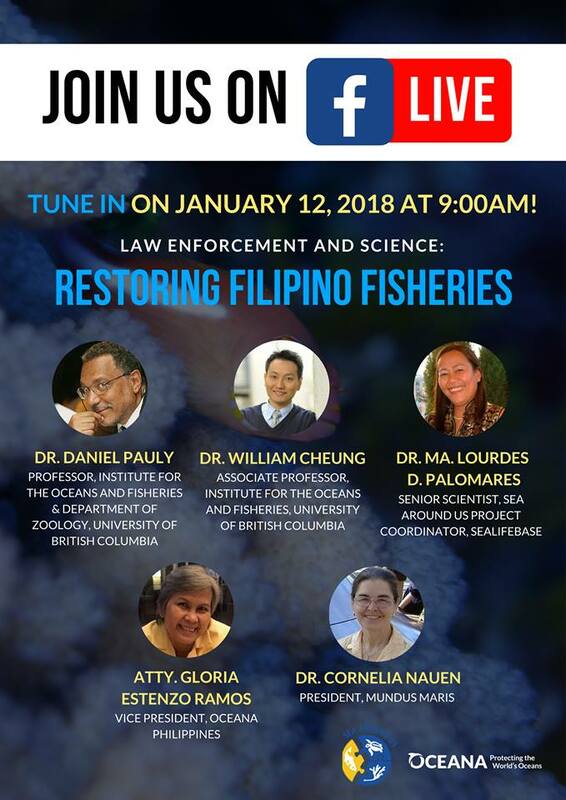 Considered as the “center of the center of marine foreshore biodiversity” and one of the major fish producers of the world, the Philippines is severely exposed to overfishing, illegal fishing, pollution and climate change. The unabated destruction of critical marine habitats is taking a toll on the country’s food security. “These alarming wake-up calls should compel all of us to work together to finally stop and eradicate illegal and destructive fishing,” says Oceana Philippines’ Vice President Atty. Gloria Estenzo Ramos. 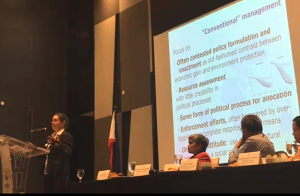 “Coastal local government units and national agencies like the Department of Agriculture (DA), Department of Environment and Natural Resources (DENR), Department of the Interior and Local Government (DILG), and our police and armed forces must ramp-up enforcement efforts to protect the marine resources we still have. Local communities must continue to collaborate with various stakeholders and be vigorously engaged in assessing and evaluating the performance of public authorities in coastal and marine protection and take action to ensure sustainable management of our fisheries.” (Source: Sea Around Us). 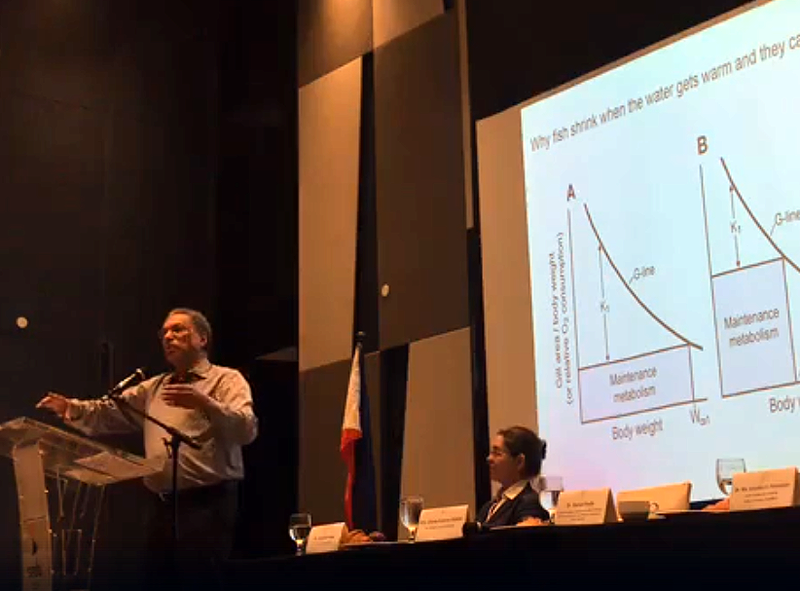 Dr. Palomares stressed that “increasing demand for fish creates depleted stocks; if the stocks are sick, there will be more hungry people; and more hungry people leads to sicker stocks. It’s a vicious cycle”. 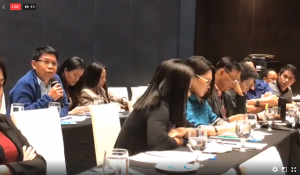 She also emphasized that building knowledge on resource management requires sharing of data via publications and data sharing mechanisms such that these can be made accessible, and thus, be of use to resource managers. 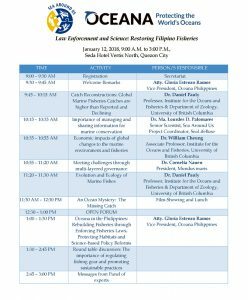 This momentous event for ocean conservation in the Philippines was held at Seda Vertis North Hotel in Quezon City, Philippines on 12 January 2018, from 9:00 am to 3:00 pm. The entire program was made available to the public through a live coverage by Oceana Philippines on their Facebook page [part 1, part 2]. 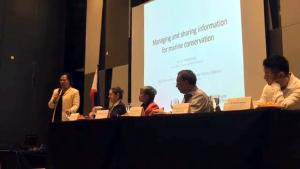 See also “Renowned Marine Biologists Talk About Ocean Conservation in the Philippines” blog of Sea Around Us. More photos in Oceana PH Facebook post.